This excellent piece by the amazing Penny Nickels is based on a print from 17th century German engraver Matthaus Merian. I think it's even better than a print because it's embroidered! I also love her original choice of subject which made me want to read more about it. It appears that St. Vitus Dance was a rather odd medieval phenomenon where large groups of people would dance in a bizarre fashion. In Basel in 1536 for example. Some people died during those dance outbreaks. From this image we learn that that didn't stop them from joining in anyway. I guess it's a little like being in the "Pit" at shows now....beautiful piece, he embroidery really mimmics the old style print look. Thank you for the nice words! I'm glad this piece turned you on to dancing mania, I'm fascinated by it! Amazing work, but brought back some sadness for me. My mum had a disease called St Vitus Dance, it attacks the nervous system and makes you twitch, hence the 'dance'. She spent many months(ss a teenager) inside in the dark. Eventually she came through it without any physical scars but has many bad memories of the suffering she endured and the taunting from those who did not realize this was an illness. A beautiful embroidery but not one I shall share with my mother. Thank you for sharing. Actually it was a disease and totally involuntary. Many people died from it. And it still exists in Third World countries. I'm so sorry if this post brought along sadness for one or maybe more Feeling Stitchy readers. I was aware that it was also the name of an actual disease not just a medieval dance mania. What I have read about it the two are really different things. The people dancing away in medieval times did not suffer from this disease, it was a social phenomenon (or maybe one or two did suffer from this or another disease who knows...) I imagine it was more like a mass hysteria. 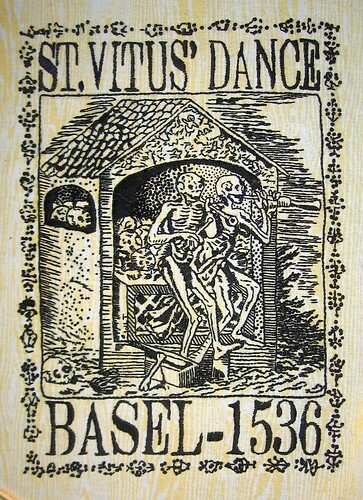 The name St Vitus Dance was later also used for the disease. Again sorry if this has cause any one grief. This embroidery sparked my interest as an historian but I should have been more sensitive and could have taken other things into account as well. It's interesting that this piece brought up so many emotions for people. My husband, Johnny Murder from Manbroidery has Tourette's Syndrome. Although he has vocalizations and tics all the time, when he was a child it was much more severe. His mom passed a few years ago from Parkinson's and Alzheimer's, and obviously involuntary muscle movement was a big part of her illness as well. He and I are both fascinated by the way various illnesses are treated and explained throughout history, and that's some of what I was exploring with this piece. Although I am aware of St. Vitus dance as a form of Choreia/Rheumatic Fever("Chore" from Dance and St. Vitus as patron Saint of Dancers), most of the material I've read on medieval dancing plagues do not definitively put forth a solid diagnosis. There is mixed opinion about whether it was mass hysteria, a virus, or even ergot poisoning. No one knows for sure, and with the mania cropping up several times over a few 100 or so years, there could have been different reasons for each outbreak. Anyway, I hope people understand that I'm not making light of current illnesses, only exploring what people struggled to understand in medieval medicine. The description to the dance is erroneous, it was not a dance but an outbreak of a disease and one of the symptoms was rapid jerking of the hands and feet that resembled what some thought to be a dance. It Was common in children between 5 and 15 but some doctors think it developed while in the mothers belly. It is now commonly known as Huntington's Chorea. Yes, I'm sure that when the dancing plagues of the middle ages were common, striking hundreds of people at a time, they all had Huntington's disease. Weird how they all became symptomatic at the same time. I wonder why it was so contagious.